WILLIAMS CHEMIST - SWINDON, THIS IS SWINDON. William Williams had been born in 1860 at Talgarth in Breconshire, Wales. In 1890 he married Maria Catherine Williams who had been born in the parish of Llantilo Pertholey, Monmouthshire in 1859. 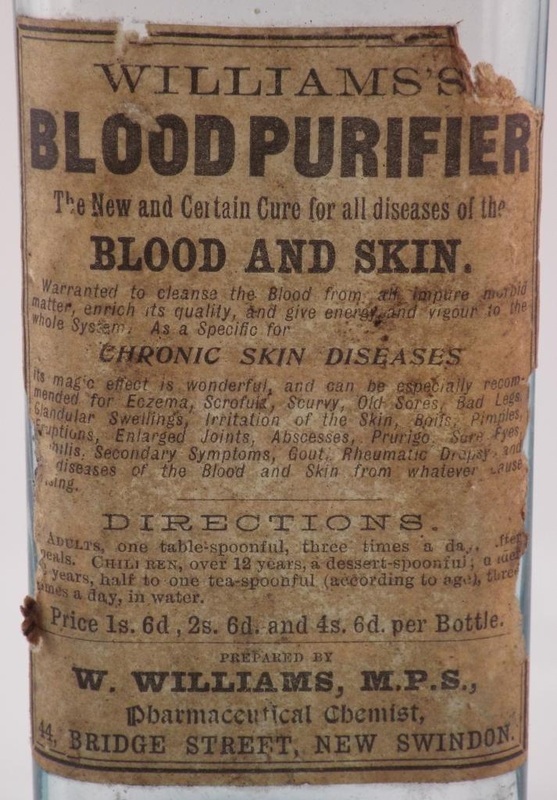 They appear to have moved to Swindon in about 1890/91 and by the time of the census in 1891 are shown living at 44 Bridge Street where the profession of William Williams is given as a Pharmaceutical Chemist who is employing a live in chemists assistant and a domestic servant. In 1893 daughter Ethel May Williams was born. In the census of 1901 the family are still shown living at 44 Bridge Street. William Williams died at the comparatively young age of 43 on the 16 August 1903 and was buried in the Radnor Street Cemetery in Swindon. At the time of his death The National Probate Calendar shows him as of ‘Ty Gwynne’ The Sands (Bath Road) and 44 Bridge Street, both in Swindon. His estate was valued at £3547 15s and probate was granted in London on the 24th October 1903 to his widow Maria Catherine Williams and Thomas Williams, a farmer. Maria Catherine Williams remarried in 1905 to John Strachan and died in Swindon at the age of 73 years in 1933. In November 1899 William Williams, E.R. 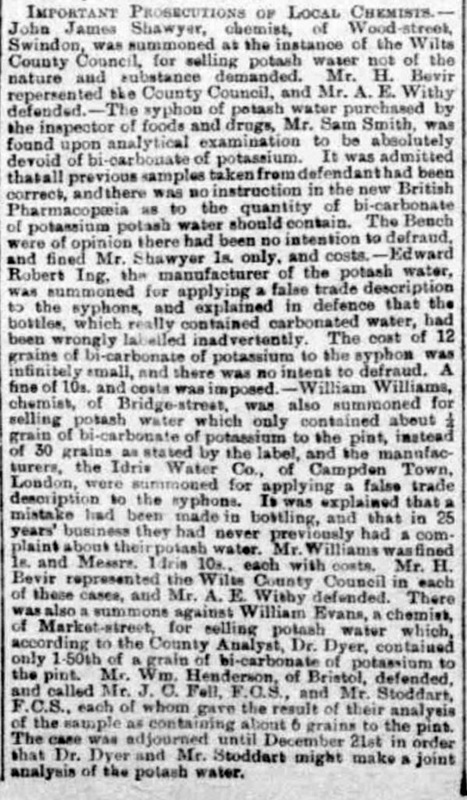 ING and SHAWYER were all prosecuted by the Wilts County Council for selling Potash Water ‘Not of the nature and substance demanded’. The story appeared in the local press and the example here is from an edition of a Gloucestershire newspaper called ‘The Citizen’ and was published on Tuesday 28th November 1899.